This recipe was adapted from Bella Eats, adding a package of frozen spinach. It’s a relatively easy and tasty meal that works well for weeknight family dinner. The goat cheese is a nice smooth flavor that the kids like. 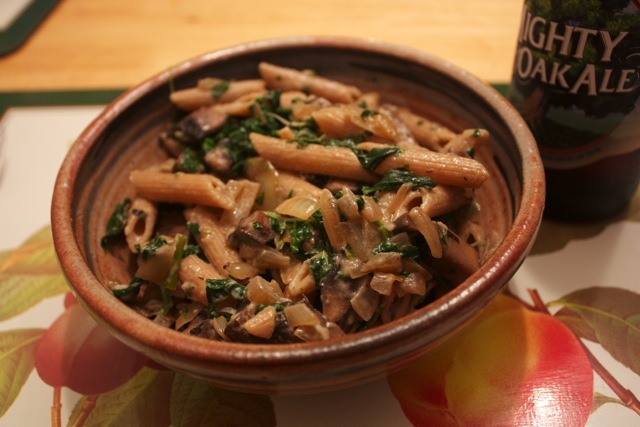 Using whole grain pasta and adding the spinach makes this a bit more of a healthy one-pot dinner. In a large pot of boiling, salted water, cook the pasta until just done. Reserve 3/4 cup of the pasta water and drain. In a large sauté pan, melt 1 Tbsp of the butter with 2 Tbsp of the oil over medium-high heat. Add the onions and the sugar and cook, stirring frequently, until the onions are well browned, about 20 minutes. Remove from the pan. In the same pan, melt the remaining 1 Tbsp butter with 1 Tbsp of the oi. Add the mushrooms and cook, stirring occasionally, until tender and brown, about 8 minutes. Add the reserved onions, the parsley, spinach and the pepper. Toss the pasta and 1/2 cup of the reserved pasta water with the mushroom mixture, the remaining 1 Tbsp oil, the goat cheese, and the Parmesan. If the pasta seems dry, add more of the reserved pasta water.